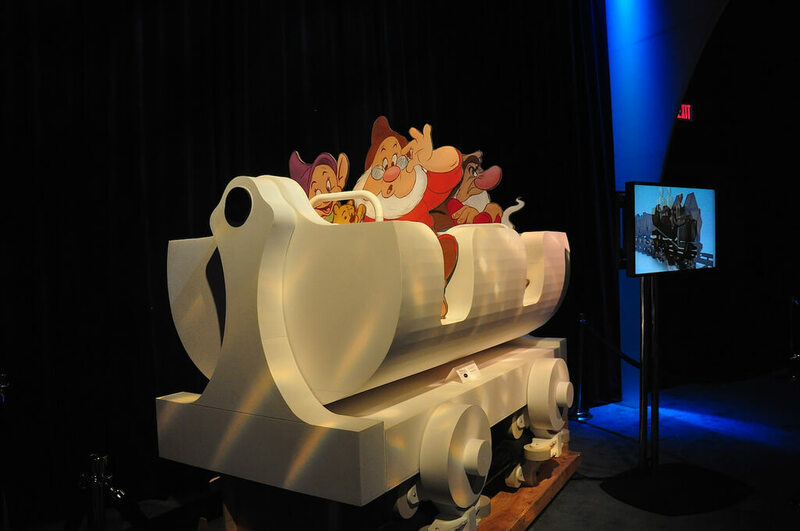 The recent 2011 D23 Expo offered attending Disney fans a chance to get updated on all ongoing Disney projects by getting up-close views of concept artwork, scale models, and even face-to-face conversations with Walt Disney Imagineers. 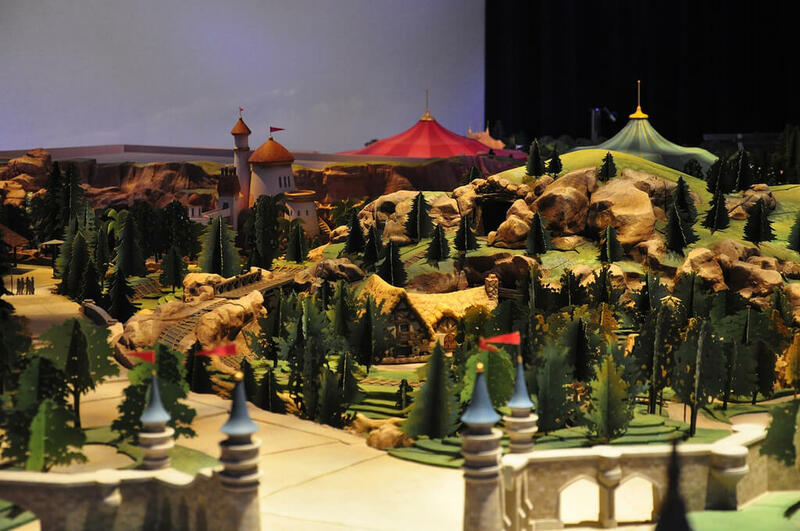 Inside the Walt Disney Parks and Resorts pavilion, one of the most impressive features was the large model of the New Fantasyland expansion for Walt Disney World’s Magic Kingdom theme park. 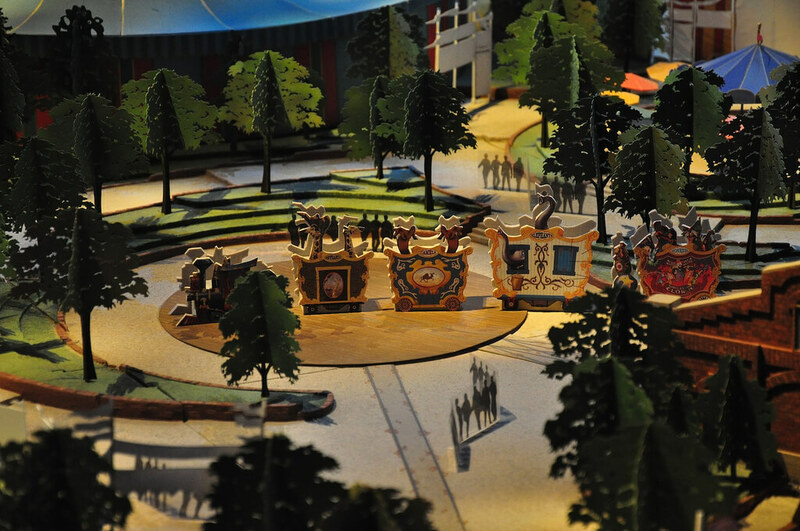 This model, coupled with insight from lead Imagineers on the project standing nearby, offered new details on what can be expected when the new park areas open. The most important detail to come out of this interview is an idea for when each of the phases of the expansion will open. Being in mid-2011 now, by the current projected timeframe, all phases of the New Fantasyland expansion won’t be completely open for roughly 2.5 years. Mallwitz did emphasize there will be “micro-phases” within each of these timelines, so not all attractions grouped together above will necessarily open at exactly the same time. With so many new attractions coming to the Magic Kingdom, it’s likely each major addition, such as The Little Mermaid ride and Be Our Guest restaurant, will open on the same day, but rather within a few weeks of each other. But what exactly is the story of Storybook Circus and what other attractions will be found within? Mallwitz was kind enough to finally answer these questions, at least in part. As the story goes, a spur track has been “added” to the Fantasyland Railroad and the famous Casey Jr. train from “Dumbo” has come down that new track to unload a 1930s/40s circus in Fantasyland. 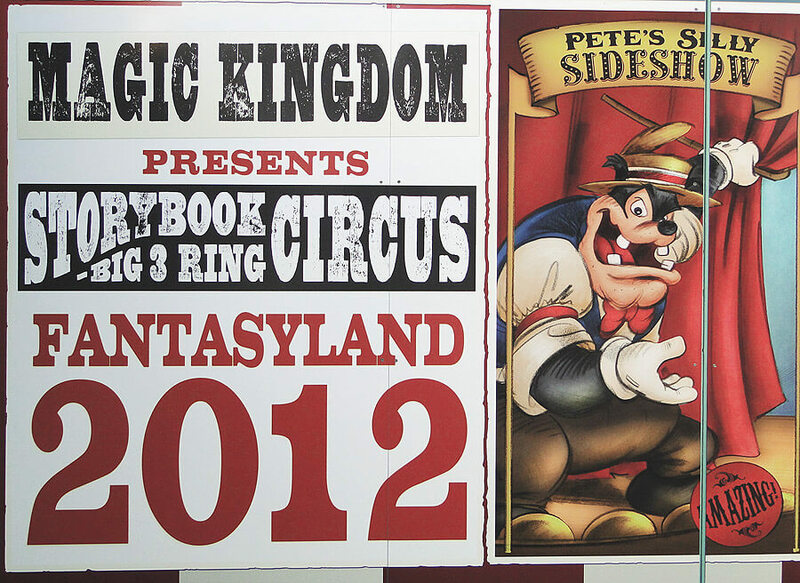 Beyond the sideshow, Big Top Souvenirs will offer the obligatory shop for Storybook Circus, in the same location as the former store for Mickey’s Toontown Fair. 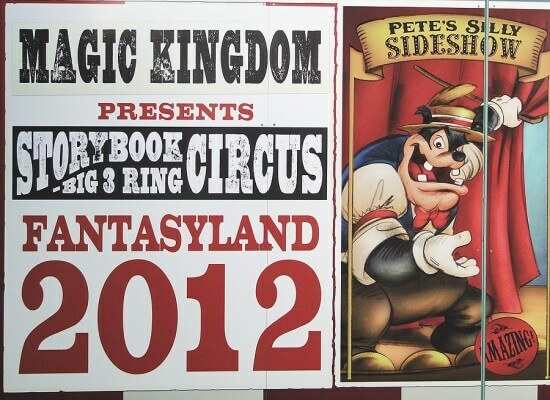 We can expect see half of Storybook Circus open in 2012, with the rest making its debut in 2013. A new Cinderella Castle wall erected near the existing carousel will serve as the transition between the castle courtyard and new Fantasyland forest. The “tournament look” of the castle area will disappear beyond the wall into lush landscaping with plenty of trees, waterways, and winding paths immersing guests into an environment unlike anything seen before at the Magic Kingdom’s Fantasyland. 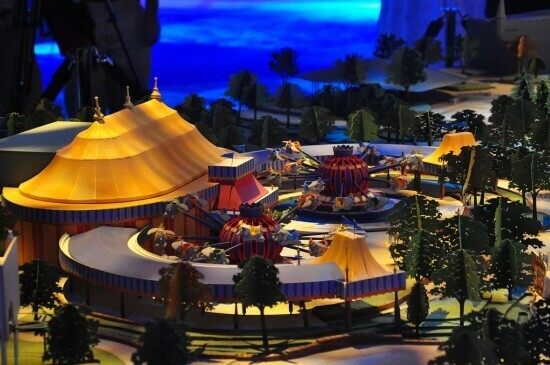 Here guests will find the new ride based on The Little Mermaid, a version of which recently opened at the Disney California Adventure theme park. 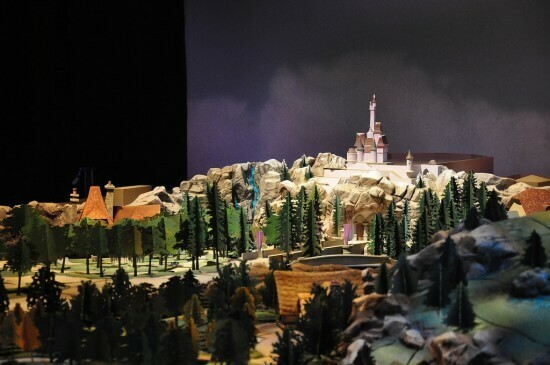 According to Mallwitz, guests will be able to approach Prince Eric’s castle because “the tide has gone out”, though some “tide pools” will linger amidst “castle caverns” that form the “underside” or “foundation” of the castle, where the ride’s interactive queue will reside. And the recently-removed Ariel’s Grotto will return beside her attraction, with a chance to meet The Little Mermaid herself in a natural setting surrounded by rocks and waterfalls. Nearby, the Be Our Guest restaurant in Beast’s castle, and an elaborate meet-and-greet with Belle, featuring an advanced Audio-Animatronics version of Lumiere, along with a few other magical Disney touches. 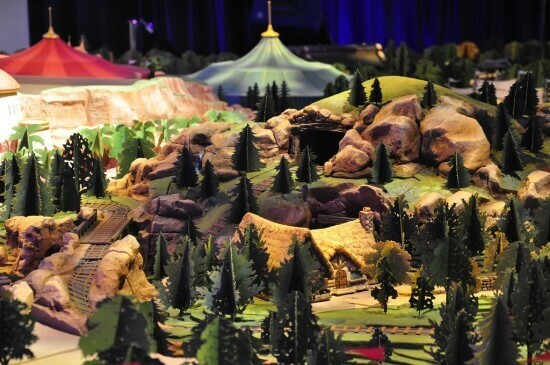 The final phase of the New Fantasyland expansion will see the addition of the Seven Dwarfs Mine Train roller coaster. With the Snow White’s Scary Adventure dark ride closing to make way for a new Princess meet-and-greet area, this all-new ride will be a combination of dark ride and roller coaster, thrilling enough to offer excitement, but not enough to scare away anyone. It’s said to be on a thrill level just above the Barnstormer (soon to be The Great Goofini), but below Big Thunder Mountain. Beyond the combination of coaster and dark ride, the most unique element of the Seven Dwarfs Mine Train coaster will be the ride vehicles themselves. 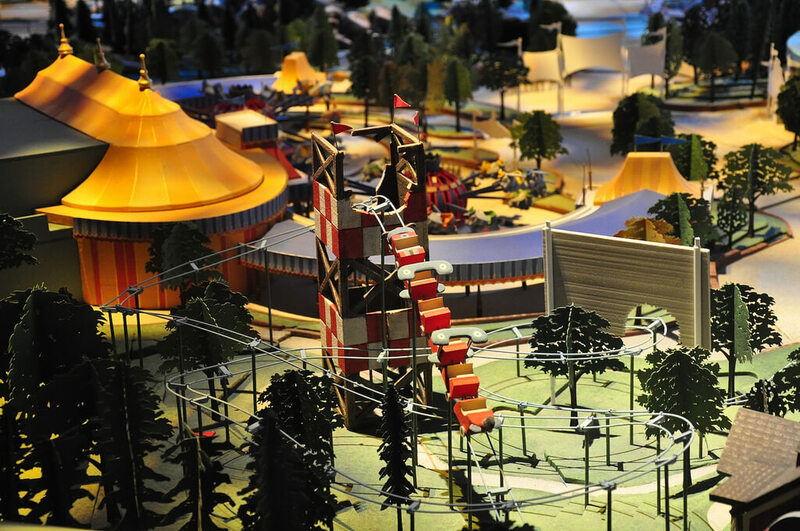 Imagineering has developed cars that swing left and right, independently from the ride track’s direction. And as such, the ride will never be exactly the same twice. Mallwitz explained, “Each car is going to rock differently because each car is slightly loaded differently.” So loading up one side of the car with heavier riders will surely offer a swinging experience. Mallwitz also emphasized that this new coaster will add energy to the Fantasyland forest, offering a thrill for those riding it but also something entertaining to watch for those walking around nearby. The details revealed above are just some of the newest specifics to get excited about as the New Fantasyland expansion takes shape around the Magic Kingdom. Construction walls currently run from the former home of Ariel’s Grotto all the way past the Mad Tea Party to the former home of Mickey’s Toontown Fair. These walls will move around as phases are completed and new ones begun between now and the final unveiling of the last piece of this Fantasyland puzzle. SO MUCH GREAT NEW INFO! This is a great article to highlight everything about the expansion. You really did a fantastic job with the video and pictures and writing! Thanks for posting this fabulous information and video. I’m very excited by everything I’ve read and seen today! Thanks so much for posting these videos and new info! Thanks for the info and video it’s awesome including the new seven dwarfs mine ride and vehicle looks awesome to ride in late 2013! Grade A stuff. I’m unqntseiouably in your debt. Thanks for the info and video! 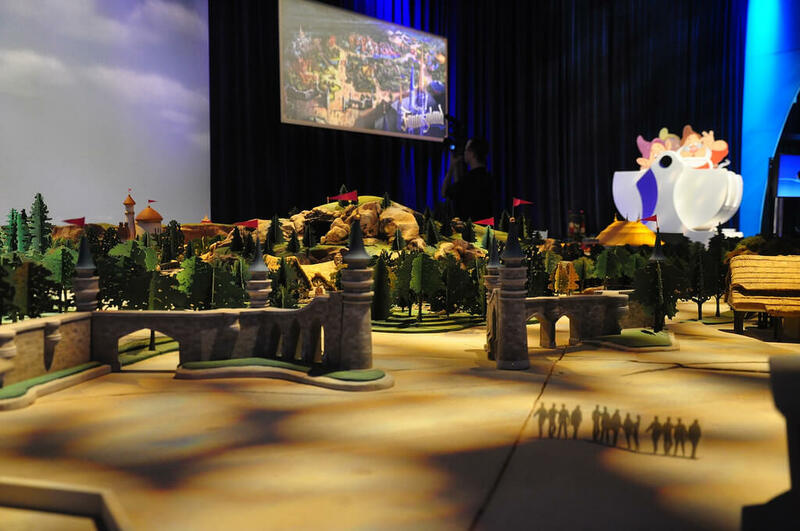 looks awesome including the new seven dwarfs mine ride and vehicle looks awesome to ride it in late 2013 and I can’t wait to ride it in the late of 2013! I can’t wait to see the New Fantasyland in WDW in 2012-2013! What about Peter Pan, Philarmagic and its a small world etc.? Where are all those attractions playing into the expansion? I AM SO SO EXCITED ABOUT THE EXPANSION!!! Those attractions will remain where they are, untouched. The expansion is only changing the other side of Fantasyland. Ricky, thank you for the detailed update, great photos, and videos of the New Fantasyland Expansion! With that, I wanted to point out a “terminology” or “measurement” mistake made by Scott Malwitz (and mentioned in your accompanying text). Scott said the New Fantasyland Model was “1/4 scale” and then he said “which means that for every 1/4″, it’s 1 Foot in real life”. If the model is “1/4″ = 1 Foot”, which I believe it is, then the model is actual “1/48 scale”. That can be figured out be determining how many “1/4 inches” will “fit” in “one foot”. There are forty-eight “1/4 inches” in each “one Foot”. What Scott should have said was that the model is “1/48th scale” or he could have said “1/4 Inch to the Foot scale”. Common sense will also tell you that the Fantasyland Model can’t be “1/4 scale”, because “1/4 scale” to “most people” means that the object (or in this case the Model) is 1/4 the size of the actual object. 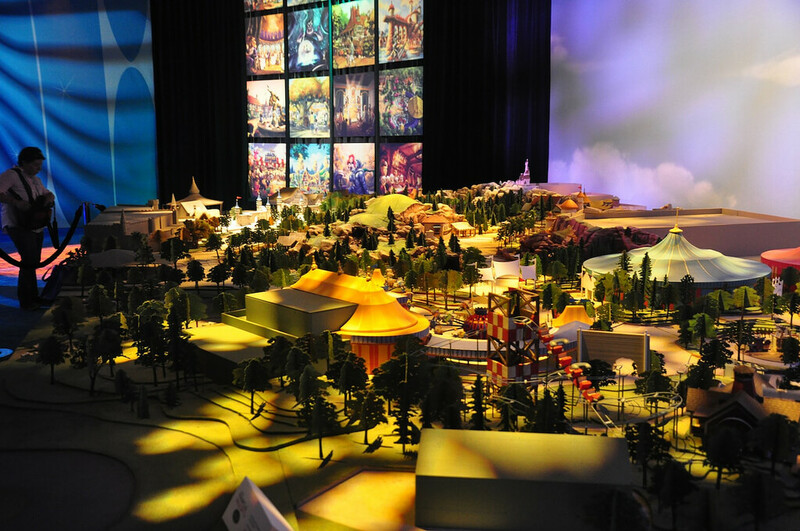 Well, if you can imagine “enlarging the Model” to be “four times as big as the Model currently is”, your common sense will tell you that the actual New Fantasyland will be much, much bigger than that “four times” size. Now, imagine the Model enlarged 48 times its current, viewable size. OK, now you’ve got the actual (human) size of New Fantasyland. I hope this makes sense! Actually, 1/4 scale is a common term in construction. It’s easier to refer to the ratio used for scaling than the actual fractional ratio. When we say 1/8 scale, or 1/4 scale, etc., it’s understood to be “… to the foot”. Proper way of writing this isn’t 1/4 scale, however, it’s 1/4″ scale (or quarter-inch scale). Then you tell the reader that the units are quarter inch-to-the-foot. 1/4 scale means one-fourth size (especially when talking about a scale model). Leaving off the units is lazy and confusing: 18″ Stonehenge anyone? What does late 2012 mean? We are planning on going September 25-30, 2012 and we are super excited. Will the Beauty and Beast castle and Ariel ride be open by then? I personally believe that you will be safe at that time. Walt Disney World gets super busy in the later months of the year with Mickey’s Not-So-Scary Halloween Party, Thanksgiving, and Christmas celebrations. My bet is that they will try awfully hard to have that area done by September to bring more guests in before the holiday spike in attendence. Of course, I also know that Disney tries very hard to get their projects done efficeintly anyway – it’s possible it may be open even before then, but we cannot be sure. what exactly does early 2012 mean, I am going march 2012? Unfortunately no specific dates have been revealed yet. Looks cool! But it looks as if some elements have been dropped. I haven’t been able to find information to confirm this so I’m just going on assumption here by the model and by the updates that Disney has provided for us. There was supposed to be a Sleeping Beauty attraction and a Cinderella attraction but I don’t see any mention of them anymore and by the model shown, I don’t see any random cottages “off in the distance”. I also heard that the Pixie Hollow area was dropped from the Fantasyland expansion too. I was just wondering if anyone knows this for sure. To be honest thought I’m not too disappointed that this was dropped. The new Pixie Meet and greet area (in Adventureland I believe) looks nice and I don’t think that the other areas would be able to compete with such attractions like the Seven Dwarves mine coaster (which I’m super excited about). So all in all, I’m waiting in anticipation for the first phase of this expansion to be complete but I just want to make sure that I get correct information from a reliable source. You’re right, much of the original plan has been dropped, including the elements you mentioned. Pixie Hollow will not be built, nor will the other Princess cottages. The Princesses will have an indoor meet-and-greet called Princess Fairytale Hall, which is replacing the current Snow White dark ride. I’m planning on going this friday, the seventeenth. We got a map in the mail and on the magic kingdom one, theres an asterict next to the barnstormer, the fantasy land station, and the casey jr. splash n soak station. On the side the asterict says scheduled to open late February 2012. Another website I saw said that part of fantasy land may be opening february 18. Is this true? Hi! I am taking my daughter to Disney in June for her birthday. Can you tell me for sure that Dumbo will be reopened ?! It was her favorite last time! Yes at least half of Dumbo will definitely be open by June. I am so disappointed that my little girls will not be able to walk through Mickey and Minnies homes… That was always a favorite of mine. If you like the classic rides and Toontown. Then you will need to plan a trip to Disneyland in California. Mr. Toad, Snow White and Mickey and Minnies houses are still there. This expansion is all hype and no cigar. The build up has been running for years (first announced Sept 2009). All I can see is a new kids roller coaster with a lot of padding out and a 5 year lead on the publicity. It’s not quite Hogwarts!! what year will all of the new fantasy land will be completed i want to go but id like to go when its all done.thanks. I really love disneyworld and i can’t wait till the expansion to fantasy land!!!!!!!!!!!! ROLLER COASTER AND MORE CAN NOT WAIT!!!!!!!!!!!!!!!!!!! You say for the snow white expansion late 2013 and some sites say 2014, I am planning a trip for christmas 2013, so you think it will all be completed? Late 2013 / early 2014. Disney has not yet set a firm date, so it’s possible it’ll be open for your trip, but no guarantees. Any news on when mine ride card ride opens? I did a Disney themed proposal for my now fiancée, since we’re Disney nuts. I’d like to go during the Not-So-Scary Halloween party. We went last Xmas and this is our last “Disney World Bucket list” trip. It’s set to open in early 2014, though a soft opening in late 2013 is possible. Will the dwarf mine defimitly be open and running mby july 4th of 2014, we are planning a trip during this time and I dont want to book if it will not be open. and to know thaqt iit can be her sacred and divine. whole country, is California’s State Route 1. It is more effective at delivering messages complete with supporting information and documentation. Thanks, can I get a side of kick-in-the-teethwith that. made houses already constructed homes. Whatever is a stake, journalism ethics ught not tto be shoved away to the trunk burner. The processing fee with this license is generally $100 along with soe states it is usually lesser than that.